It's time to divvy up the dragons' hoard, but no one wants to share! Can you trick your fellow dragons into leaving you with the most treasure? 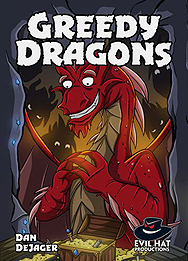 Greedy Dragons is a simple but strategic card stacking game. Overlap cards and build Lairs to collect all the gems - and leave your opponents empty-handed! Play one-on-one or team up with other dragons to maximize you loot. Add the magic ring to the hoard to raise the stakes even higher. There are plenty of options to make for hours of gold-grabbing fun! Watch out for those greedy, grabby gem-crazy dragons!